Karan Johar has admitted the nepotism joke targeting Kangana Ranaut at the IIFA Awards stage was his idea. Filmmaker Karan Johar has admitted the nepotism joke targeting Kangana Ranaut at the IIFA Awards stage was his idea and it is something that he regrets now. Johar, Saif Ali Khan and Varun Dhawan raked up the nepotism debate during the award ceremony on July 15, where the trio chanted "nepotism rocks", mocking Kangana for calling the "Ae Dil Hai Mushkil" director the "flag-bearer of nepotism" on his chat show earlier this year. Varun apologised on Tuesday, while Johar in an interview with NDTV on Wednesday said it was a case of a joke gone wrong and his intention was never to hurt anyone. "What we said was meant to be a joke, which I think has been misplaced, misunderstood and I think it went wrong. I regret it. The idea of that joke was entirely mine, so I take on us of the idea of what we said. And I think we went a bit far by the Kangana mention." Read more: Shah Rukh Khan to be a part of Karan Johar's next with Ranbir Kapoor? "No matter what I say or feel about my issues with what Kangana said on my talk show... I think I was raised to be dignified, chivalrous and a decent person. That's the upbringing that I was given and I feel that I failed on those accounts", he said, adding that he is closing the chapter once and for all. 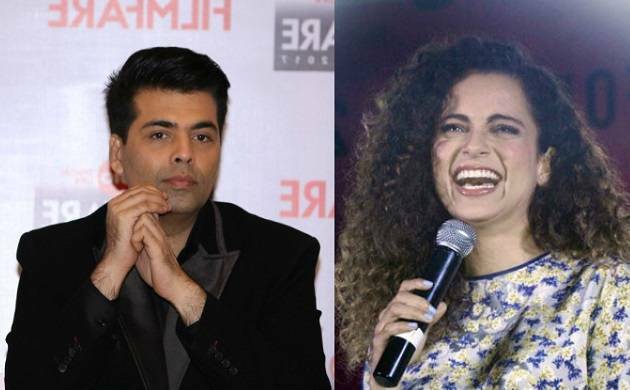 Kangana's comment on Johar's show had kicked up the nepotism storm in Bollywood, where family connections often lead to better career opportunities. Johar had taken umbrage to the actress' remark, which led to a verbal duel between him and Kangana after the show aired. The topic cropped once again at the recently-concluded awards ceremony. When Varun went up to the stage to receive the best comic actor award, Saif joked, "You are here because of your papa." To which Varun replied, "You are here because of your mummy (referring to Sharmila Tagore)." Soon, Johar joined them and said he too was in the industry because of his father, filmmaker Yash Johar. The trio then shouted, "Nepotism rocks". Saif and Varun then sang "Bole chudiyaan" from Johar's film "Kabhi Khushi Kabhie Gham..." But the director twisted the second part of the song to take a potshot at Kangana, saying, 'Kangana na hi bole toh achha hai' (It would be better if Kangana did not speak). The actress, known for her outspoken nature, is yet to respond but the joke has backfired for the trio with netizens criticising them for their sense of entitlement. Comedian Tanmay Bhat posted, "I just realised they legit yelled 'Nepotism rocks' at the end of it and I cannot stop facepalming." "I don't know what kind of entitlement you need to actually find 'nepotism rocks' funny. Like yeah, it did for you and that makes you a loser", a Twitter user said.